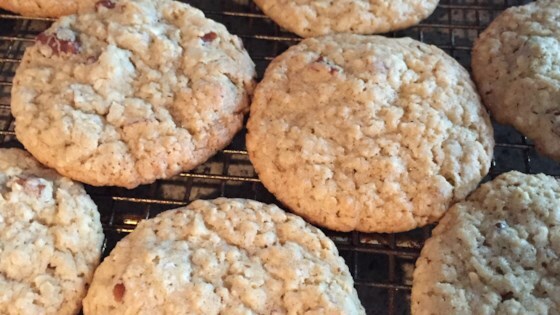 "A very tasty cookie that goes over very well at any gathering." Sift flour, baking powder, soda and salt. In a separate bowl cream butter until fluffy; add sugars, eggs and vanilla. Beat well. Add flour mixture to butter mixture. Mix well. Stir in oats, nuts, and coconut. Mix until well blended. Bake on ungreased cookie sheets for 10-12 minutes at 350 degrees F (180 degrees C). These cookies are so easy to prepare. I add 1/2 teaspoon orange extract and 1/2 teaspoon freshly grated orange peel for added flavor. Also, sprinkle with confectioners sugar when cooling. Yummy!! This is a great recipe. Easy to make and alot of flavor. I didn't have vinilla so I used orange extract. I would use orange extract again. Thanks for the recipe!! These are very good. I definitely will be making these again. I will give this a "5+"! Made these last night and they are very good. My husband was well pleased with the results. Will test them out on my church folks this afternoon.